Oh Lindsay I LOVE your easy, healthy meals and this is no exception! This looks amazing, and I love all those crushed up peanuts they add such a fantastic texture! Oh why hello, gorgeous! THIS is what’s making my stomach growl at 7:30 a.m. My oatmeal suddenly seems a bit lacking with all those gloriously swirled noodles ;). Love that you shot this on that wood backdrop as well! It brings such a nice warm and earthy feel to the photo! Feel free to send over a plate of this to California haha! Happy Monday! Thanks Cristina! That’s so sweet and encouraging! Thank you! So easy and awesome looking! I can’t wait to give this recipe a whirl. Pad Thai is a BIG deal in our house. Like, I make the sauce on the reg and keep it in the fridge so we can face plant into it ALL the meals. And the rainbow goodness? HECK to the yes. I am majorly needing some take-er-easy meals, so I am all about this. Pinned! Love it! Pad Thai fans for lyfe. Goodness, that looks mighty tasty. Okay, so as a newbie to the vegetarian world, can I ask a quick question? Is fish sauce a go for super serious vegetarians? Hosting friends tonight and this looks like just the ticket, but I want to make sure it’ll work for them. Thanks! Most vegetarians would be pretty angry if they found out after eating that their meal contained fish sauce. I would personally consider it on par with using chicken/beef broth. 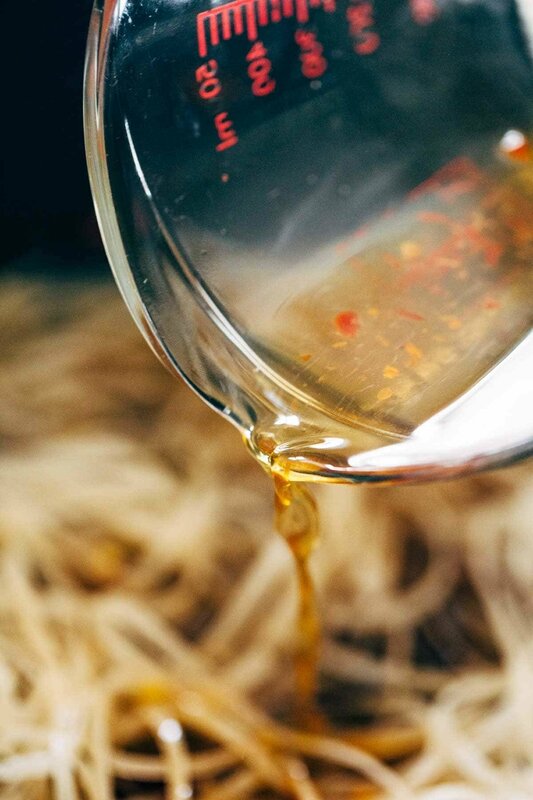 I’ve seen a recipe for vegetarian fish sauce (http://veganmiam.com/recipes/vegan-fish-sauce) and I’ve personally just swapped it out for low sodium soy sauce or a touch of miso in other recipes. Thanks for sharing Kelly! That’s really helpful. Agreed! I would swap it out if the people you’re cooking for are full time, real deal vegetarians. I also linked a vegan fish sauce in the post that you could try as a replacement! Thanks for the comment Amy! This looks so good! 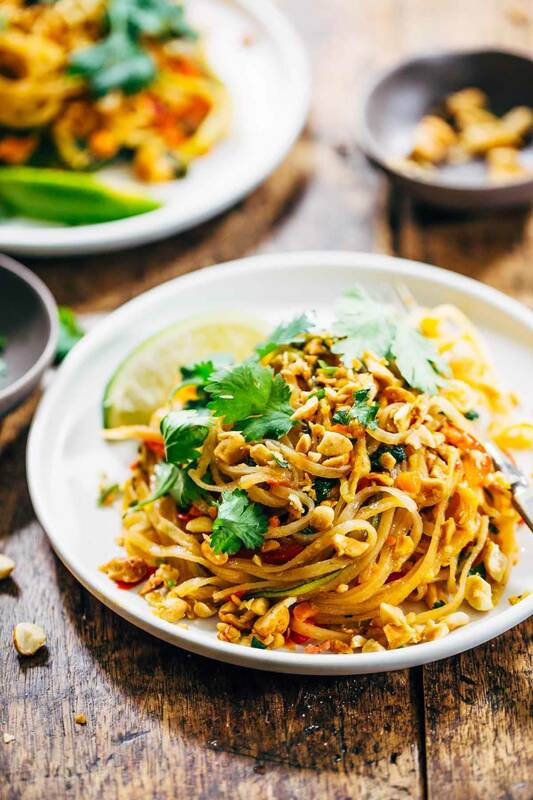 I’ve always been a little afraid of making Pad Thai at home because I thought the sauce was difficult, but your sauce appears to be so easy! I must try this out! Mmmm… That looks so good. Some people might not know, but even a small pot of Pad Thai is so filling it could feed a whole family and then some. Great food and great post. It’s so cool! I love the red pepper “noodles”! My current obsession is spring rolls, and I would TOTES wrap up leftovers (if they exist) with lettuce, some quick pickled veg, and a drizzle of sweet chili sauce. Yaaaaaaaaaaaaaas. PS- I just realized that I majorly mess up your stats. I subscribe to your email list, which I check on my “vintage” iPhone 4S. But then. I type in the website when I get to my computer for the day to read/comment/ruin all your hard work analyzing traffic to POY. Sorry! YES PLEASE! Love that idea Liz! I know how you feel about not cooking sometimes – most Sundays I get in a cooking slump – and don’t wanna do any cooking at all…then my daughter tries to eat chocolate covered noodles and I’m back in business! Haha – glad you can relate! Thanks Shashi! Yes, yes, and yesssss. What I wouldn’t give to face-plant in a big ol’ bowl of that right about now! This looks DELISH and SO impressed that you made it to the kitchen and whipped this up despite the craziness. High fives. I needed this recipe! I am a pad thai addict! I am gonna add some shrimp and a little hot sauce! YUM! YUMMMMS I love that idea! Another awesome recipe, the pictures make it look absolutely delicious. 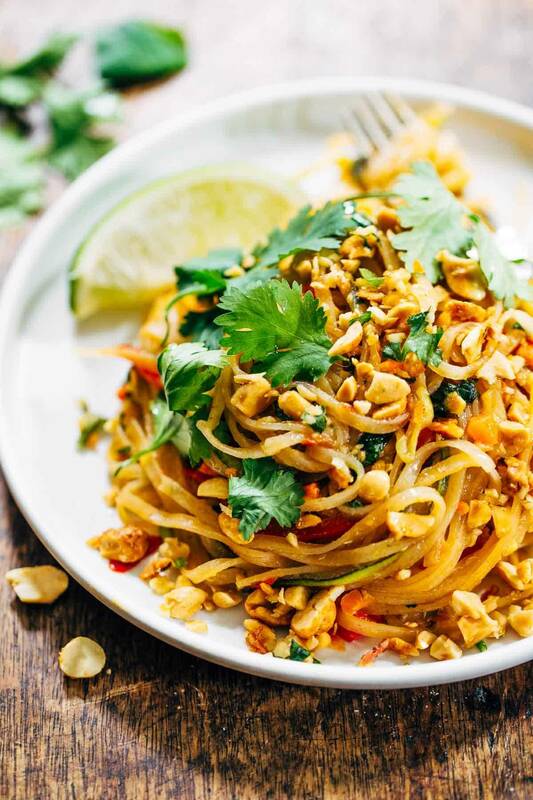 I’m not a fan of meat less Pad Thai but I will be definitely be using this recipes and adding meat to it. Awesome! Hope you enjoy it Chris! 🙂 I love Christopher’s comment about adding shrimp… that could be good too! Yay another peanut sauce recipe overflowing with veggies. These are the recent recipes from you site that I love the most. Thanks for staying creative with your healthy meal ideas! 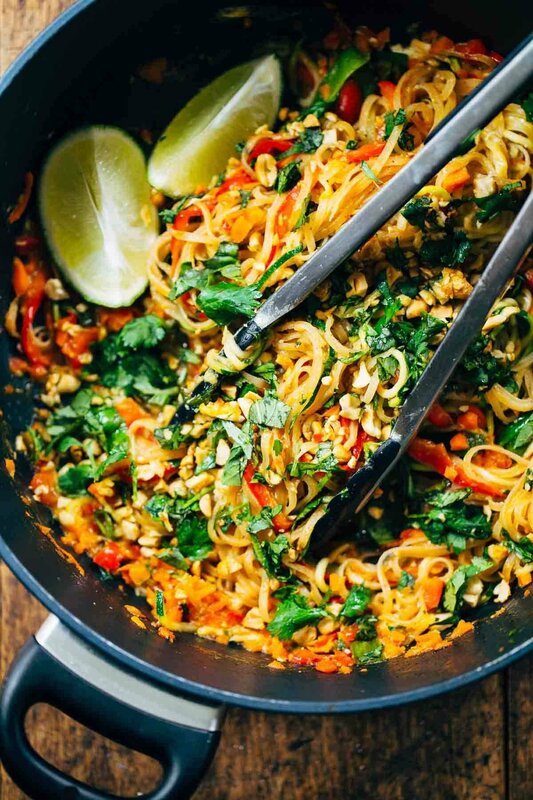 Big bowls of noodles are the best, but it’s the saucy noodles that get me….I NEED this! I think what you are doing for those kids is so amazing. You deserve some time off from cooking. This recipe looks delicious; I can’t wait to try it! I have that exact spiralizer and I love it. Question about the fish sauce – I have tried some very yucky fish sauces. Can you recommend a brand that is good? Thanks! This recipe looks absolutely delicious! I will definitely have to give it a try! 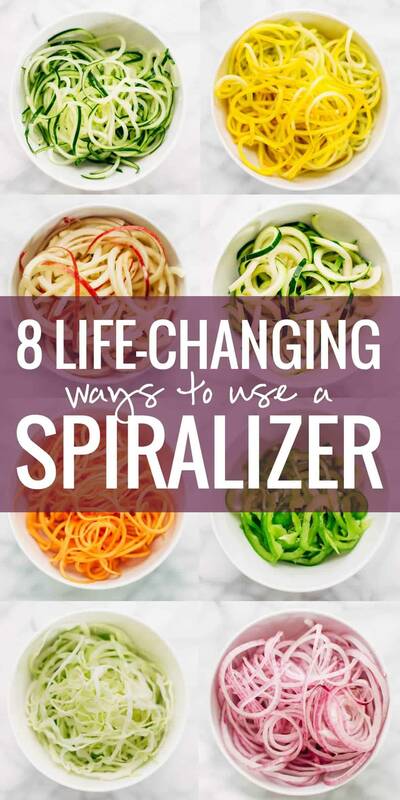 I have that exact spiralizer too & love it! Looks great and probably tastes great. WARNING – heart bomb for anyone with heart problems or potential heart problems. 58% sodium???? 2 – Do you smoke? ( I have had 3 heart attacks in a year and well under 10% functioning heart so had a little experience LOL) Guess both God and Devil don’t want me yet LOL. Would love to taste this recipe though. Looks fantastic. Love your site by the way. Such a great reminder, Max. It’s definitely a good idea to use low sodium ingredients when possible. Thanks! how simple yet AWESOME is this recipe?! the sauce is such a keeper too, would be perfect for summer rolls!!! Made it tonight and loved the favors! 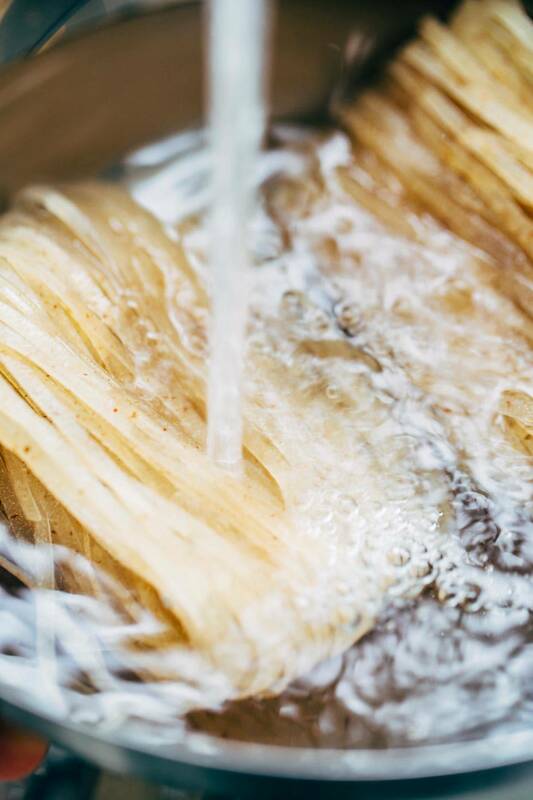 Two problems, though… The noodles didn’t soften and the fish sauce remained stinky after dinner. Very disappointed about the noodles since it made the meal inedible. Next time, I’ll boil them a bit or maybe use some whole wheat angel hair pasta (cooked). The fish sauce – what can you do..? It’s a bit stinky to me. The dish had great flavor though so I’ll make it again. Live spiralizing all the veggies! I couldn’t end on a fail so I made it again tonight. AWESOME!! Bought the correct noodles (love them) and added chicken. Stir fried the chicken in sesame oil with a little crushed red pepper at the beginning and tossed it in at the end. So good!! Thank you for a delicious meal! 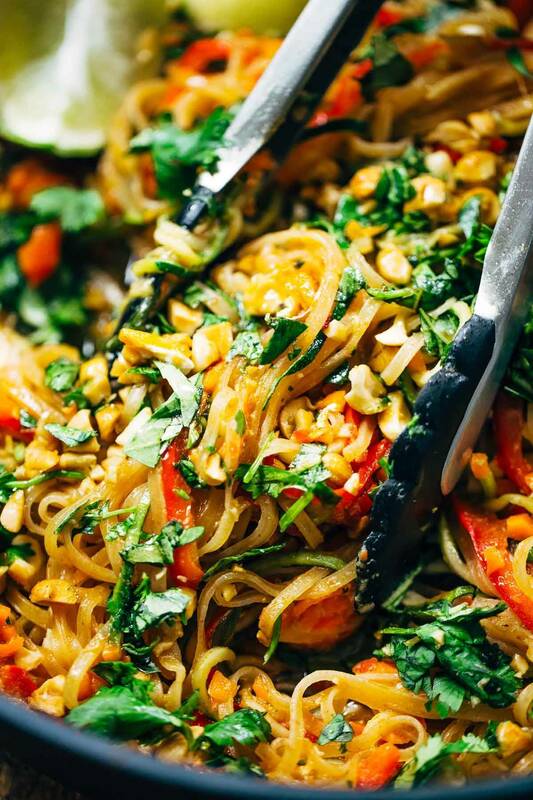 I love Pad Thai and this recipe was delicious. I just added a bit of tofu. I haven’t use rice noodles before. I will have to cook them a bit next time as they needed to be softer. My only problem using noodles is getting them incorporated into the dish. I generally end up cutting them in half or they won’t separate. Do you have a suggestion?